The 360 release of Silent Hill HD Collection will remain forever broken due to "technical issues and resources." 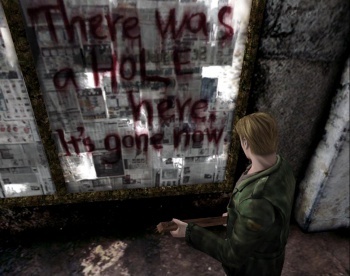 From a technical perspective, Silent Hill HD Collection is, by most accounts, a shambling disaster of a game. Built on unfinished code, what was supposed to be a celebration of Konami's venerable horror franchise actually turned out to be a glitch-riddled mess. Last month, Konami got around to patching the PS3 version, but there was no news of a patch for the 360 release. Now there is: There isn't going to be a patch for the 360 release. "Plans for an Xbox 360 title update have been cancelled due to technical issues and resources," announced Konami. "Understanding the issues some users are experiencing, Konami issued a title update for Silent Hill HD Collection (PS3), which fixed frame rate issues as well as audio-synching and other reported issues. KONAMI apologizes to any players who are continuing to experience these issues on the Xbox 360 sku. Silent Hill HD Collection is available at retail stores nationwide." It's unclear if the "resource" problem is tied to the production of the patch, or if it's a reference to the high costs involved with getting a title update onto Xbox Live. Recently, developer Phil Fish blamed Microsoft for his failure to fix a potentially game-breaking bug included in a patch for Fez, claiming that Microsoft wanted a "ton of money" to distribute a second update. Regardless, if you're desperate to get your Silent Hill on in HD, it seems the mildly less broken PS3 version is the way to go.